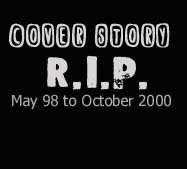 Cover Story, formed in May of 1998, And ended in October of 2000. It featured T.J. Smith (vocals and rhythm guitar), Brian Kinnaman (vocals and lead guitar),Matt Hall (Drums), and Adam Boyd (Bass). The four members of Cover Story brought together a wide variety of musical interests in an attempt to create something pleasing to the ear, and glorifying to GOD. "It's like making a cake. Explains Brian Kinnaman, You have very different ingredients. That by themselves don't look like much. Then you mix them up and bake it and you have a very delicious cake." Cover Story has performed at festivals and Coffee Houses throughout the Northwest and has shared the stage with Bride, Chris Kanani,Miss Angie, Seven Day Jesus, Skypark, The Kry, The Waiting, and various others.